Already three of Stefan Feld’s games have received our „Game of the Month“ title: all were well constructed economic games, satisfying our zest for planning without being neither too solitaire nor prone to analysis paralysis. Luna belongs to the same category, too. We send our heads of the Orders to various action fields, allowing them to recruit novices, build shrines and eventually move sanctified novices into temples. Many of these actions have positive effects on later actions; hence we need to find an efficient sequence for them. Some of the actions yield victory points resulting in direct player competition. We may rowdily supplant an opponent when entering a temple while protecting us from the same fate. Interaction is hence provided for. 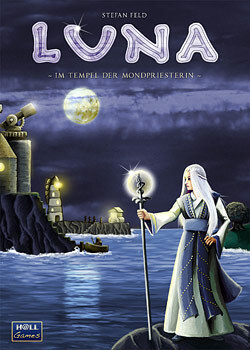 Overall “Luna” delivers a constructive and gamey experience.